Implementing Integrated Education Policy for On-Reserve Aboriginal Children in British Columbia, 1951-1981. Helen Raptis is an associate professor in the Faculty of Education at the University of Victoria. Her research interests include both historical and contemporary perspectives on social and cultural diversity and schooling in British Columbia. Raptis, Helen. 2008. “Implementing Integrated Education Policy for On-Reserve Aboriginal Children in British Columbia, 1951-1981.”. 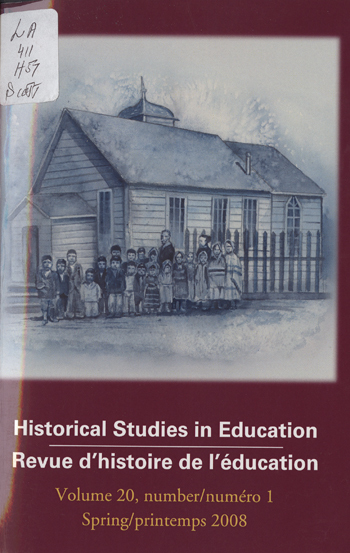 Historical Studies in Education / Revue D’histoire De L’éducation 20 (1), 118-46. https://historicalstudiesineducation.ca/index.php/edu_hse-rhe/article/view/26. In 1951, the Canadian government changed the Indian Act to allow for the integration of previously segregated on-reserve aboriginal children into the nation’s public schools. Although British Columbia’s first integration initiatives actually predate the 1951 legislative changes, most on-reserve children did not attend off-reserve public schools until after 1951. As elsewhere in Canada, British Columbia heralded the 1951 legislation with fanfare and optimism. However, three decades later the Union of BC Indian Chiefs issued a policy statement calling for alternative options for aboriginal children. This paper traces the province’s earliest integration initiatives until 1981. It illustrates a complex and dynamic implementation process that changed considerably over time. In particular, it demonstrates the difficulties provincial authorities encounter in attempting to leverage change at the level of individual learners.